Our good friend Chucky, editor of Shoot! Magazine, informed us last week that the battle to keep the magazine running is over. It started with Trails End magazine, which was later purchased by Shoot! I have received many emails and phone calls about this and the #1 question is how and why. Well, first of all, I am not an insider. It is none of my business and let me add, running a magazine or any media outlet is in fact a business. It’s not charity, at least it’s not supposed to be. I have and will talk about this in general. I might as well talk about something that our industry on both sides of the fence don’t talk much about, at least in public. Publishing a magazine in a time where media is changing faster than you are able to keep up with is a tough business. Publishing a magazine in a small niche market is a combination of tough business and labor of love. You have to be part idiot, part naive and part business person to survive. In my opinion, I believe Shoot! Magazine did everything they could do in all of those combinations. It all came down to this – the market simply was not big enough and the resources was no longer there to build or rebuild it. So, let’s digest the simple explanation when it comes to Shoot! and let me talk about all this in general. Internet is one of the reasons why the niche market and the magazine business have become a survival ground, not a goldmine. We have become so accustomed to the free flowing of information through the Internet that subscription to the paper format is no longer on the top of our shopping list. I know I am as guilty as anyone else from a consumer standpoint. On the other hand and on a daily basis, I deal with different media outlets, magazines, online services, TV shows and most important, the gun industry. I also discuss marketing strategies with many of them who are on both sides of the fence. There are no fixed solutions to many of the challenges. But from a publisher’s standpoint, getting either a TV show, internet magazines or paper magazine advertisers on board to finance an operation is all about a give and take relationship between publisher and advertiser. For all of us that are involved in this business… let it be said out loud. The gun industry is as dependent on us as we are on them. Some admit it, some don’t. Our job is to fight an ongoing battle to keep a balance between giving and taking. For those who take more than they give, may very well win, but it’s a short term victory. It sounds cruel, but it’s that simple. To be able to work in this business on both sides of the fence, you have to accept these facts and not waste time complaining about it. For us involved, we simply have to love the battle and realize it is a part of our lifestyle and work environment. Keeping the balance is goal #1. Keeping the sanity spiced with a good sense of humor is goal #2. So, when I learn that a colleague has to face the cruel fact about finances, I know what a battle it has been. As a matter of fact, it takes a lot of guts to survive as long as Chucky has. When you don’t have the back-up by a big publishing company who can afford to run a magazine on life support for a period, it is a matter of time before you run out of ammo so to speak. So why can’t a magazine serving the cowboy action market survive? I have partly answered it already, but there is another big factor involved. Cowboy Action Shooting is no longer a booming business and those involved including the firearms industry have not been able to adjust and create a new market within CAS. Within that setting, the industry is not longer standing in line to invest in marketing and they try desperately to get coverage and commercial messages out through editorial content. Why? Hell, it’s free. Why wouldn’t they if the media allows it? Editors and producers accommodate all this partly to keep the readers and viewers happy but they often sell themselves short because the publishing deadlines are creeping up on them. Down the road, it has to stop. It always does. If the numbers turn red, you don’t have much choice. But that’s not the bottom line, folks! You see, when the give and take relationship becomes unbalanced and another important shopping window (another word for media) for the firearms industry goes under, this media outlet is not the only loser in this battle. The firearms industry suffers in the long run, so do we as consumers and firearms enthusiasts. The same goes for the organizations that want to recruit new members of either hunters or shooters. We are all one big family.We do have different responsibilities and goals, but the bottom line is: We are all dependent on each other. Yesterday, I had conversations with 2 different importers/manufacturers of firearms about this very topic. They were both seeking advise about marketing and how to get the most out of their budgets. Well, that’s what I do – give marketing and advertising advise. I have been doing it for over 20 years within different industries, the last five have involved firearms and the shooting sports. Those who know me, know where I stand – if there is an unbalance between giving and taking, I get what I call an honest attitude and I don’t try to hide it. We are all in it together fighting within the market place, publishing information and commercial messages and keeping both industries and their markets floating and alive. When it comes to decision making, it is a matter of an open mind, good two way communication, a budget and who we want to work with in a trustworthy environment. I deal with two main groups when it comes to marketing within the firearms industry. Those who share my views and those who don’t. I like them both because it keeps my feet on the ground. The only thing that gets me way off the ground, are consultants from outside the industry who give bad advise based on zero knowledge of the firearms industry and the outdoor media. It’s like listening to a neutered tomcat teaching the importance of wandering around in an alley finding a new partner. But the fact is in the open. Those who agree with me survive, not because of my advise in particular, but because they are able to see for themselves the importance of finding that balance between giving and taking between the firearms industry and the media. It always pays off in the long run for both parties. I am always sorry to see another “family member” and shopping window disappear. Chucky, thanks for having supported the shooting sports and the firearms industry as long as you did. I know that I can speak for others as well as for myself when I say.. “A job well done”. 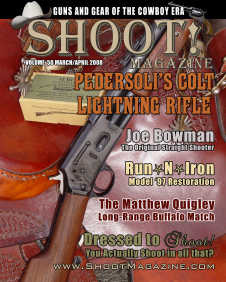 For you out there looking for some CAS history, look up Shoot Magazine Mercantile. They are now selling back issues at a discounted price. You can also read the last 2 magazines online here. Good article Marshal. One statement you made was, “running a magazine or any media outlet is in fact a business. It’s not charity, at least it’s not supposed to be”. I couldnt agree more. I think I will leave it at that so there is no more rancor occuring regarding Shoot. Truth is, I think we will all miss the magazine, but the signs were there for a while that it was going down. And thank you for making CAS City a great place to hang out. I’ll miss SHOOT! and wish the staff all the best. I thought it was a well constructed magazine and infinitely more interesting than Guns of the Old West, which has no qualms in reviewing the same gun but different calibers or even different finishes in back to back issues. Very well put. I have been a reader since the days of Trails End. These are difficult times, and I was never “brave” enough to venture out into the great unknown of free enterprise. I have always liked to know how much I am making at any given time. Those of you that do brave the deep water have my respect. Shoot has always been an excellent magazine, and even when the waters were getting deeper, Chucky and crew still tried to give us what we wanted. I will miss the magazine (and so will my mailman) and I wish Chucky, Smith and Jones and all the very best in the future. A well written commentary. I must say, however, that I don’t understand the article on the 1911 auto pistol in the final issue, and to a lesser degree, the Freedom Arms article. 1911 fans have their own magazines; they aren’t going to buy a cowboy magazine for a 1911 article, and cowboy shooters are more than likely going to shake their head in disgust. At least, that’s what I did. Obviously, the market was too small for a cowboy-guns-only magazine. I lament its demise but question some of the logic behind the attempts to save it. I want to echo Marshal’s comment, thanking Chucky for ‘A Job Well done’. I will miss this magazine greatly. Hopefully maybe down the road there can be another venture and a new magazine be born. Best wishes to SHOOT’s publishing family.